Despite big selloffs in recent months, it's still up roughly 110% in 2018. 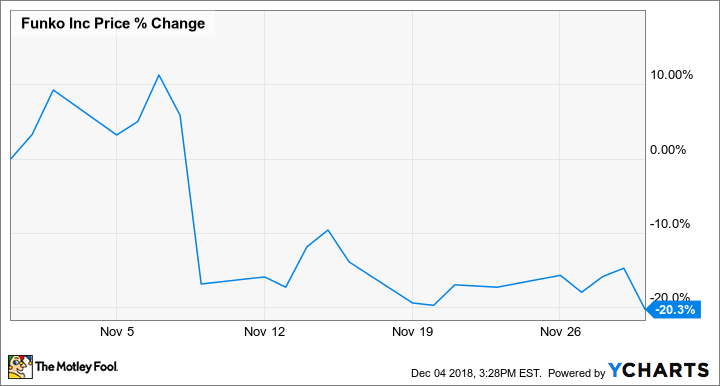 Shares of Funko (NASDAQ:FNKO) dipped 20.3% in November, according to data provided by S&P Global Market Intelligence. The pop-culture merchandiser's stock continued to cool off last month despite third-quarter results that came in ahead of the market's expectations, and an increased full-year earnings target. Funko reported third-quarter results on Nov. 8, beating the average analyst estimates for sales and earnings. Revenue for the quarter climbed 24% year over year to reach $176.9 million and top the average analyst estimate's call for sales of $166 million. Earnings per share for the period arrived at $0.27, beating the average analyst estimate by $0.05. But declining profits and gross margins versus the prior-year period sent the stock tumbling. A fad or a pillar for the future? Image source: Funko. Funko's third-quarter gross profit margin fell 250 basis points compared with the prior-year period to land at 38.4%, with the decline stemming from a reduced average sales price in the European market. Net income for the period dipped 2% year over year to $8.1 million. Still, Funko stock has more than doubled this year thanks to strong sales growth and momentum for the broader pop-culture merchandise market. But profit erosion appears to have spooked investors, and questions remain about whether the company's popular figurines will prove to be a sustainable business pillar or just a fad. 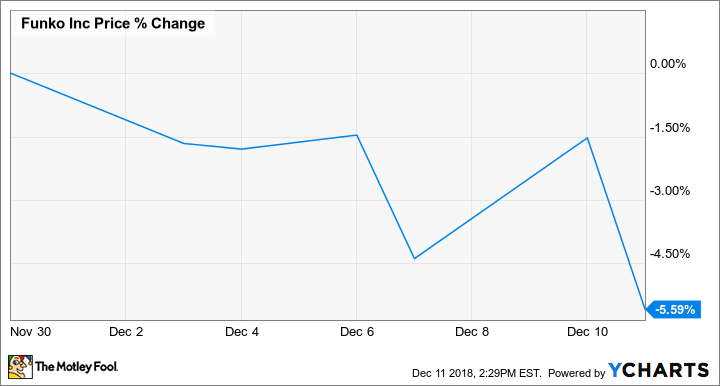 Funko stock has continued to lose ground in December, trading down roughly 5.6% in the month so far. The company now expects full-year net income of $25.5 million, up from its previous target of $22.6 million. Funko is valued at roughly 27 times its new net income target.